In Brief: Miles Cameron’s The Red Knight blends traditional fantasy elements with strong historical fiction writing to great effect. The title character leads his band of mercenary knights into the frontier to protect a vital outpost against the chaotic forces of the Wild. As the forces of the Kingdom of Alban gather to confront the Wild, we meet a number of other interesting characters, Cameron’s system of magic, and a complex-without-being-excessive setting that includes complex politics, medieval economics, and philosophical-religious overtones. Pros: The sense of historical realism, even within this fictional setting rife with magic, wyverns, daemons, places this book in rare company. Once you grow accustomed to Cameron’s method of switching between the main characters – not always to their p.o.v, but always focused on them – the method works extremely well. Excellent characterization, pacing of the action and the world-building, and a very intriguing setting and magic system. Review: Miles Cameron has a degree in Medieval History and an obvious love for historical reenactment. He also has had a fine career writing historical fiction (as Christian Cameron), is an old school D&D guy, and likes to camp in the deep woods. With swords. This is my guy. Of course, I didn’t know any of this before picking up The Red Knight; I’d just viewed a recommendation lauding the book for its blend of historical authenticity with fantasy elements. It turns out, Cameron has written a number of historical fiction books and stories (as Christian Cameron), and his knowledge and familiarity with everything from armor to fortifications to the philosophical foundations of Christianity sets this novel apart. The Monuments Men (directed by George Clooney, based on the book by Robert Edsel and Bret Witter) would be an easy movie to dismiss or mock if you were so inclined. World War II film about aging scholars rescuing and returning art… Doesn’t Hollywood so like to congratulate itself about its own artistic contributions, etc., etc.. But, with Clooney determined to give us an effective history lesson, and with an all-star cast (Bill Murray, John Goodman, Matt Damon, Jean Dujardin, Cate Blanchett, and Bob Balaban) determined to tell a genuine tale, the result is a very fine movie. It is a story worth telling – the mystery and intrigue of tracking down all the art the Nazis confiscated, the misgivings of some about the allies’ goals for recovering said art, and even the race with the Soviets. And within the meta-elements of the film, a very interesting study of war-movies. The gathering of the team, the guys who despise each other at the outset only to become best friends, the showdown in Act III… At the heart of the story these Monuments Men had very noble goals, but like soldiers everywhere they continued on mostly for each other. This is a line that goes back from Saving Private Ryan to The Big Red One to The Dirty Dozen. You leave the theater on a positive note. After all, we did rescue the art and return it where possible. The important signposts of Western Civilization return home. When President Roosevelt asks Lt. Stokes (Clooney) if it was all worth it, he has a definitive answer. A little later you may find yourself considering how the same symbols and signposts, the same Western Civilization also led to Hitler, the Nazis, and the Holocaust. Well, that’s history for you. …based on the book by Seth Grahame-Smith, directed by Timur Bekmambetov, starring Benjamin Walker, Dominic Cooper, Anthony Mackie, Rufus Sewell, and Mary Elizabeth Winstead. We are of two minds about Abraham Lincoln: Vampire Hunter around these parts. One one hand, it’s a fun summer popcorn movie that takes the semi-ridiculous and makes it cool. On the other hand, my history major hand, it takes a pivotal historical figure and series of events, and throws it in the pop culture schlock-o-meter. The vampires brought forth onto this continent, a new nation, conceived in darkness, dedicated to the concept that slavery provided a steady food supply and also helps explain why there’s always so many vamps in the south. In Brief: Steampunk meets historical fiction in Victorian London, with time travel paradox and some mysticism thrown in for good measure. Author Mark Hodder hits the ground running. Pros: Fast-paced and fun for readers familiar with the history of the British Empire at its apex, the book quickly introduces its sci-fi conventions, stamps them in the plot and moves onwards. And also – werewolves. Cons: Readers with no grounding in history may still enjoy much of this book, but won’t be in on some of the most creative turns with historical figures and famous events. This book has more of a pulp feel, so some of the characters come off a little flat (or would if you didn’t have the historical versions of them to fill in space). Review: At the library, saw the cover, and read the back copy (which was written in the style of a 19th century newspaper advertisement). I immediately noticed that one of the main characters was none other than a fictionalized Sir Richard Francis Burton, famous explorer and Victorian writer and a person I’ve read about before. OK, Mr. Mark Hodder – well played, I told myself. I have to give this a look. 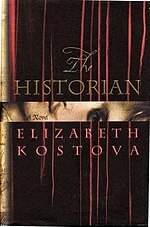 In Brief: Elizabeth Kostova’s The Historian is a character-driven novel that follows Cold War-era scholars from two generations across Europe in search of one of history’s greatest fiends. The book lives and breathes through its narrators as they uncover archival clues, lost texts, and letters while trying to avoid the dark reach of their quarry. Pros: Beautifully written, with strong accessible characters, The Historian takes the best narrative elements of historical mystery in pop culture (think Indiana Jones, Dan Brown) without dumbing it down. The descriptive prose and sometime heart-wrenching interactions are first-rate. Cons: Not many. The book is long, sprawling, and never in a hurry. Could be a detriment to less patient readers. The action of the final climax is strangely brief and understated – perhaps to avoid clichés or maybe because Kostova just wasn’t sure how to treat it. In Brief: Knights of the Black and White by Jack Whyte is the first in a trilogy dealing with the rise and fall of the Knights Templar. It begins just before the First Crusade and moves forward to the Templars’ formation and early years. Pros: KoftBW is quality historical fiction with a strong spine of research, solid characterization, and a fascinating yet plausible central conspiracy. Cons: Some of the plotting and signposting is ponderous within this 750 page tome; could have done with some more action and mayhem, but when one of your central questions revolves around excavation, perhaps this is inevitable. Review: The Knights Templar – the mysterious fighting monks of Jerusalem and the Crusader States – have always been an intriguing historical topic. Not just for yours truly, but for generations of Medieval scholars, armchair historians, and story-tellers in general. The Templars sudden and meteoric rise to prominence, their legendary secrecy and effectiveness as a fighting force, and their spectacular demise have made them quite popular. You can find the Templars everywhere from Ivanhoe to current popular authors like Dan Brown to the popular video game series, Assassin’s Creed. As far as a Beemsville nexus: I once wrote a scholarly paper about the Templar’s banking and financial system (it even appeared in the EIU graduate journal, Historia) and can also lay claim to a poorly-executed-but-cool-in-concept first act of a screenplay about them. So yeah, when I saw this book on display at our local library, I had to give it a shot.